As sweet as cinnamon: My first Published design! in Homespun is now available. I am so delighted to see it in print. A new ironing board cover and iron caddy for your iron. and the caddy fits a large iron. Great gift idea for your mum, a friend or yourself. local newsagent if you are in Australia. or click here for some in the USA. Last week I received lots of yumminess in the mail..
had on my wish list for some time now. Congratulations, Dawn! How exciting for you!!! I've not seen that magazine before...is it available in the U.S.? Because I really want to get my hands on it! LOL I desperately need a new ironing board cover and I love your design! Ohhh lovely, what a pity I cannot buy that magazine here in Spain. Darling Dawn - your project is absolutely STUNNING!!! I love to iron... and once I've made your pattern I know I'm going to love it even more! Well done Dawn. Congratz on a great design. I'm off to buy the mag. That's 3 of my fave designers featured in it. Got my magazine in the mail yesterday and I was so excited to see what you and our Vikki looked like in print!!! SO chuffed to see your fabulous ironing set ... Dawn it's simply GAWJUS!!!!!!!! You should be so proud :o)!!!! CONGRATULATIONS!!!! I just received my mag and they are both lovely.Hope to see more of your designs in more mags in the future.All the best with your designing :) Barb. Congratulations Dawn. Early this week I rang my local Newsagent and he is holding a copy for me. It will come out on the mail truck tomorrow. How exciting, I can't wait. Hi Dawn, love the designs. Congrats. Also visited Vikki's site - another one to add to my list! Happy stitching. p.s. Have talked two of my friends from work into doing the next Kelly Wolfeson workshop at Hetties! Well done...I got my copy a couple of days ago but didn't get a chance to read it until last night.....good work!! Congrats on your first publication Dawn. How exciting. You go girl!!! Love the ironing board cover and the iron caddy, beautiful stitchery, it's fabulous!! I would love to get my hands on that magazine, but not sure where to find it in the USA. Will have to check around. Congratulations Dawn on your first published pattern - Homespun is a great publication, well done. My copy arrived in the post today and I have been longing for a ironing board cover for my half sized board that lives next to my sewing machine, so loving the instructions that I can adapted to suit. So now all I have to do is get sewing, so I have a fancy board and special iron caddy to show off at patchwork retreat. Congratulations Sweetheart...you've done us proud with such a pretty design which will make the ironing a much nicer job. Just love it! Hi Dawn. Congratulations on your first published design. This is so exciting for you. It looks lovely and I am sure it will make ironing a pleasure. Congratulations on having your pattern published Dawn! It really is a beautiful ironing board cover. 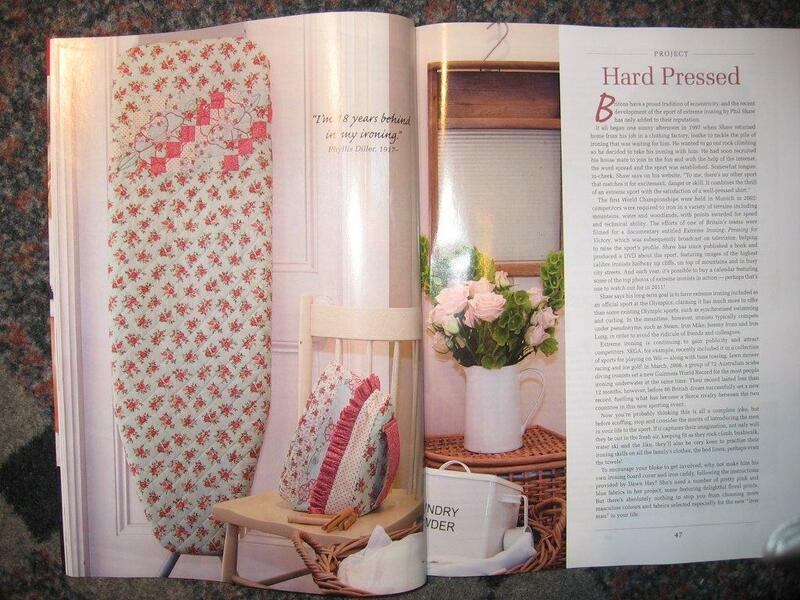 I think I need to do my poor old ironing board a favour and make it your lovely cover. Oh Dawn, congrats! It's beautiful!! Such a lovely project and one I'd love to make myself. Thanks and again huge congrats! !